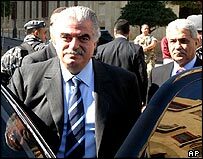 A UN team investigating the murder of former Prime Minister Rafik Hariri in Lebanon has completed its fact-finding mission, say Lebanese officials. The team will present its findings to UN Secretary General Kofi Annan when the members return to New York. The report's conclusions are expected to be released to the UN Security Council at the end of March. The Security Council called for the inquiry following international outrage over the 14 February murder in Beirut. Head of the team, Irish Deputy Police Commissioner Peter Fitzgerald, informed Lebanese President Emile Lahoud that inquiries had been finished, a presidential palace statement said. Mr Fitzgerald thanked Mr Lahoud for the co-operation of the Lebanese authorities, the statement added. The team has been in Beirut since 24 February investigating the bomb attack on Mr Hariri's motorcade. It was assembled after the UN Security Council asked Mr Annan to report on "the circumstances, causes and consequences of the assassination". The murder sparked international condemnation, and massive public protests in Lebanon over Syria's military presence in the country. Many blame the pro-Syrian government and Damascus for being behind the killing - charges they deny. The Lebanese government rejected calls for an international investigation into the attack, but agreed to co-operate with the UN mission. Syria has begun pulling troops back to the eastern Bekaa valley. Its intelligence agents began leaving Beirut on Wednesday - ending a 30-year presence in the city.